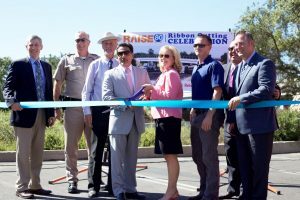 This morning, PCTPA joined Caltrans for the “Raise 80” Vertical Clearance Project ribbon cutting celebration. The event took place in Loomis alongside the Horseshoe Bar Road overcrossing, one of the nine overcrossings in south Placer County now in compliance with new federal height requirements. The Raise 80 project addressed new federal height requirements by lifting seven of the overcrossings and lowering the highway under the two remaining overcrossings. Now, oversized trucks no longer have to detour onto local roadways past our neighborhoods and schools. In addition, the project replaced bridge railings, poured new concrete sidewalks, repaved bridge roadways, and planted landscaping to reduce erosion. These features all enhance the roads and freeways that the communities of Loomis, Rocklin, Penryn, Newcastle, Weimar, and Magra rely on. Learn more about the project and how it is keeping Placer moving at www.Raise80.com.